Some 15 delegates travelled to Srebrenica and learned more about the vital work of the International Commission for Missing Persons (ICMP) in reuniting families with the remains of loved ones. 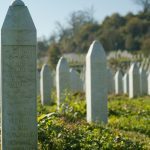 They returned to the UK to begin planning a Srebrenica-based performance in their community – aimed at raising awareness of the genocide and challenging hatred. Here, three members of the group are filmed at the Srebrenica-Potočari Memorial Complex – where some 6,000 genocide victims have now been laid to rest. Adam Taylor, Arifa Raza Azmi and Farah Suleman tell us about their experiences in Bosnia and how the visit has affected them.